Qualifications Required: Sales, management and trade qualifications are a bonus but not mandatory as we provide all training. Customer focused, motivated and people looking to take control of their future. Marketing Support: We provide all high level marketing and branding. We help you conduct an initial local marketing campaign and also have a library of ready to go marketing resources for new Franchisees to utilise in their local area. 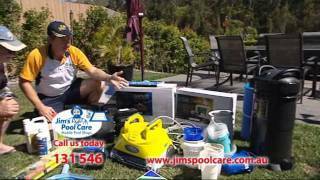 JIM’S POOL CARE – Franchises for Sale – MOBILE FRANCHISES. Find all the latest franchises for sale all around Australia at Inside Franchise Business. It is time to become your own boss and take control of your future. The Jim’s brand is recognised by 94% of Australian adults and coupled with the accrued business acumen and proven systems, your business will have an enormous head start over your competitors. Jim’s Pool Care provides you with the opportunity to work outside, to work your own hours, to be your own boss and to build your business without limit. You may have already identified that your main reason for considering becoming a Jim’s Pool Care franchisee is to either change your lifestyle or to increase your income or both. Taking control of your destiny is a big move but we are here to help you on that journey. We are here to help you reach your goals, with full training and ongoing support. So if you are prepared to put in the hard work and ongoing effort required to grow a successful business then we want to hear from you today. $69,000 – We are looking for the right motivated person to choose one of these exclusive sites and to work in partnership with is to build an amazing mobile business.